KIEV, Ukraine -- Russian Foreign Minister Sergei Lavrov says he will seek an immediate ceasefire to the conflict in eastern Ukraine at talks in Berlin later. Clashes have raged along the front line for the past few days, causing heavy civilian casualties. He said Russia did not want a new Cold War and that the West would not be able to isolate his country. 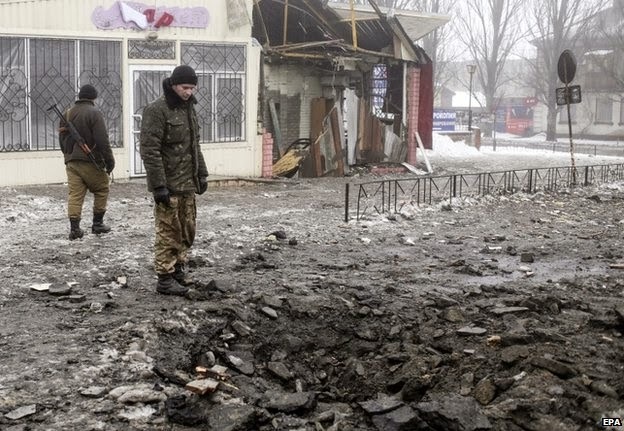 Violence has escalated in eastern Ukraine in the last week. Ukraine said Russian forces had attacked two checkpoints near a town in Luhansk on Tuesday. Russia, as always, denies sending troops into Ukraine. However it acknowledges that Russian "volunteers" are fighting for the rebels. Fighting has flared up along the front line in the two eastern regions of Donetsk and Luhansk in recent days. Pro-Russian separatists have fought Ukrainian forces for control of the ruined airport at Donetsk and there have been fierce clashes at two checkpoints near the town of Slovyanoserbsk, north-west of Luhansk city. Five civilians were killed and at least 30 wounded in shelling of several districts of the rebel-held city of Donetsk on Wednesday, the local authority said. The Kievskiy and Kuibyshivskiy areas were among those worst hit. Meanwhile, Ukrainian Prime Minister Arseniy Yatsenyuk said a new law to increase the size of Ukraine's army to 250,000 personnel had been delivered to parliament on Wednesday. This signifies a rise of some 68,000 people, according to government figures. Addressing journalists ahead of a meeting with the foreign ministers of Ukraine, France and Germany in Berlin, Lavrov said that the ceasefire agreement reached in Belarus in September was failing because a separation line established under the truce was not being respected. Russia had done its "utmost" to resolve the conflict and "maintain the integrity of Ukraine", he said. He added that there was no evidence of Russian soldiers or weapons crossing the border. Ukrainian military officials said two battalion groups, both of around 400 men, had crossed into Ukraine on Monday, a statement rejected by a defence spokesman in Moscow as "hallucinations about a Russian invasion". Ukraine alleged on Tuesday that "regular military formations" of Russian troops had attacked the two checkpoints near Slovyanoserbsk, although there has been no independent confirmation. Lavrov also criticised US President Barack Obama's State of the Union address, saying the Americans had set a course for confrontation and attempts to isolate Russia would fail. Mr Obama's speech showed "that the United States wants to dominate the world and cannot merely be first among equals," he said. Lavrov called for the withdrawal of heavy weapons to end the fighting. More than 4,800 people have been killed and some 1.2 million have fled since the rebels took control of parts of Luhansk and Donetsk in April. Ukrainian foreign ministry spokesman Yevhen Perebyinis told local TV on that Russia had broken the agreements reached in Minsk in September "the first day after they were signed". He said rebels had gained 500 sq km (193 sq miles) in territory since then, he said. "Now they want the airport, and Russian armed forces are trying to broaden that territory." Geoffrey Pyatt, the US ambassador to Ukraine, told the BBC the recent escalation in fighting constituted a "turning point" in the conflict. "This recent reignition of the crisis is a consequence of actions that have been taken by the Russian government - and what's going to deescalate the crisis is the actions that Russia is going to take to stop the transfer of weapons and heavy equipment and fighters across the border." "Ukraine is the victim at this stage," he added. Ukrainian President Petro Poroshenko was to cut short his visit to the World Economic Forum in Davos, Switzerland, on Wednesday and return home in view of the worsening situation.